On either side of the road farmers were at work on their tropical plantings. We sped past the occasional grouping of tin roofed homes or a colorful shop perched on the side of the road. At dinner the previous night, our site engineer, Roberto, had promised a hard day of work ahead of us. He had recommended we all get a goodnight’s sleep. Not all heeded Roberto’s warning. Instead many of us had stayed up to enjoy conversation and the local brew, El Presidente (available in pequena, regular or jumbo). Or a sip or two of Ron Barcelo rum. When in Rome, right? Well, Roberto kept his promise. 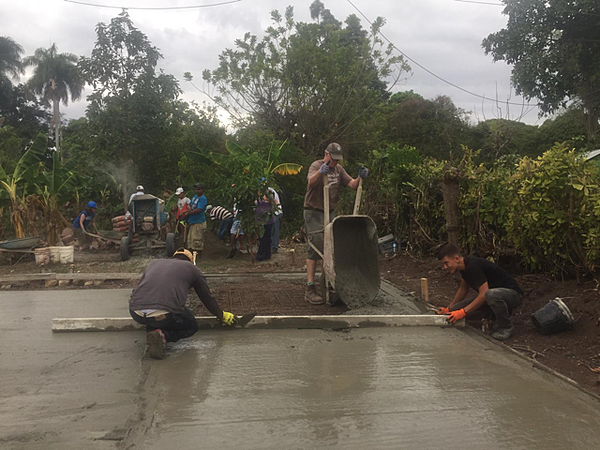 Upon arrival in the small town of Jinova, we went to work on pouring the concrete foundation of a new home. First, we rolled out and cut panels of rebar, which were then moved into place and tied together with wire. Next began the work of mixing and pouring concrete, which was hard work in the heat and humidity of the day. Thankfully the clouds rolling off the mountain shaded us from the sun for the latter part of the morning. 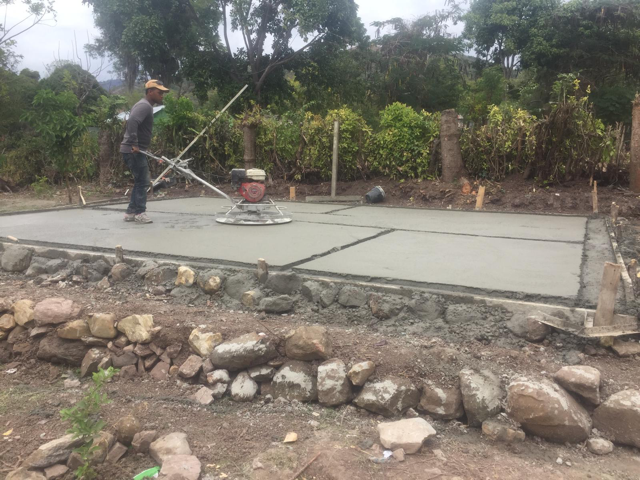 The mixture of water, dry cement, and several thousand pounds of sand and gravel that go into the foundation took us several hours of lifting, shoveling and pouring to complete. 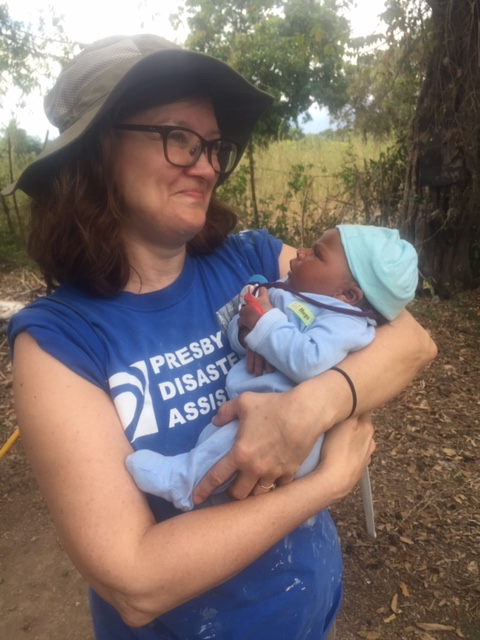 After lunch and a little rest, our coordinator, Janice, introduced us to the family who would live in the home we had started. 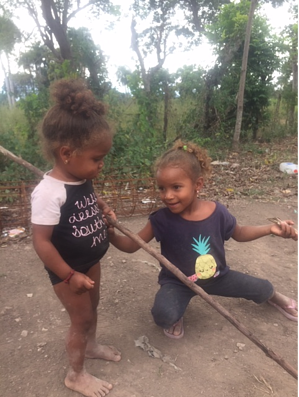 We were greeted with smiles by Assenio and Yannelys and their children: two girls, Yelianni(4) and Vitelys (2), and one-month-old boy, Angel Johnny. Janis translated for Yannelys, who said, “I am so thankful you are here! It is so nice to meet all of you.” The family welcomed us into their current home. A battered looking structure, built of rusted tin panels and wood, standing feet from the new foundation we had worked on all morning. Yannelys explained how their home leaked and flooded when it rained. With tears in her eyes, she hugged each one of us. It was evident that the new home we had started meant everything to the future Yannelys saw for her young family. In the van on our way back to our hotel, I felt very lucky to be there. To take part in this important work and to witness Habitat for Humanity’s global mission in action.